The SP syringe pumps are micro-processor controlled for applications requiring high metering precision at low, pulse-free rates. All the SP series pumps are accurate to <1% error with a reproducibility rate of ±0.1%. Select syringe from table stored in the pump’s memory and dis­played on the LCD. Enter the volume to be dispensed. Enter the flow rate and press Start. It’s fast and simple. Your settings are permanently stored in memory. There’s no need to re-enter them each day. 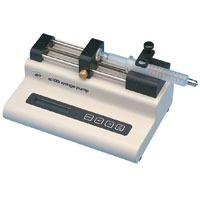 SP syringe pumps feature preset rate and volume control. Just set the volume you want dispensed. Volume is tracked continuously on the LCD display. Then, when the preset volume has been dispensed, the pump shuts off automatically. The easy-to-read digital dis­play provides real-time read­ings using both parameters and values for clearer, mistake-free readings. The SP200 Series pumps offer TTL and RS-232C interfaces and automatic shutoff under stall conditions. Infusion (single), 220-240 V 10µL-60mL (1) 519mL/hr (60mL syringe) 0.1µL/hr (10µL syringe) 20 lb. Microdialysis (double, slow speed), 220-240 V 10µL-10mL (2) 0.351 mL/min. (10mL syringe) 0.1µL/hr (10µL syringe) 20 lb. Infusion (double), 220-240 V 10µL-140mL (2) 145ml/min (140mL syringe) 0.001µL/hr 40 lb. Infusion & Withdrawal (Continuous Action), 220-240 V 10µL-60mL (4) 86mL/min (60mL syringe) 0.001µL/hr 40 lb. Infusion & Withdrawal (double), 220-240 V 10µL-140mL (2)* 145mL/min (140mL syringe) 0.001µL/hr 40 lb. 10µL-140mL (4) 21mL/min (10mL syringe) 0.001µL/hr (10µL syringe) 40 lb. 10µL-140mL (4)* 145mL/min (140mL syringe) 0.001µL/hr (10µL syringe) 40 lb. syringes may be different sizes 20.91mL/min (10mL syringe) 0.001µL/hr 40 lb. Infusion-Withdrawal (double) Single Cycle Action, 220-240 V 10µL-60 mL (4) 86mL/min (60mL syringe) 0.001µL/hr 40 lb. * Has 6/32 button thread. The 6/32 stability button allows the SP series pus to drive the syringe plunger in a precise direction to minimize variations in the syringe body/plunger offset. Not compatible with the UMP3.